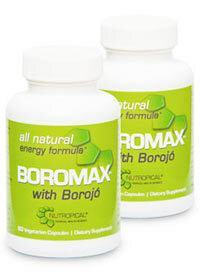 Nutropical recommends that you take two BoroMAX capsules daily, preferably with a meal. You might prefer to take your capsules in the morning, but BoroMAX is safe to take at any time of day. What are the added ingredients in BoroMAX? In addition to borojo, BoroMAX capsules contain guarana and maca, two all natural ingredients that provide energy, clarity and additional health promoting qualities. not just a few hours! Analyses have found that borojo has an ORAC value of over 5,400 (μmolTE/100 g), which exceeds the ORAC of most fruits and vegetables.